Working in chronological order, 'National Treasures' opens with the call to arms that is 'Motown Junk'. Thrashing along at a spectacular pace through fan favourite 'Stay Beautiful' into 'You Love Us' via 'Love’s Sweet Exile', a song I had never realised was a single until I read the tracklisting. The chronology serves an excellent purpose here - a barometer of brilliance for the band and the definitive way to watch the band mature. There’s something for everyone, be it trying to out-Slash Slash on the fantastic 'Motorcycle Emptiness', the somewhat morbidly excellent drama in their 'Suicide Is Painless' cover (a feat replicated by my school choir about 14 years later, exactly the song for 15 year old school kids!) to my all-time favourite Manics track, 'Little Baby Nothing', with its anthemic refrain of "Culture, Alienation, Boredom and Despair". In my eyes at least, 'Generation Terrorists' is possibly their best era. The album also serves as a reminder of tracks that pass you by completely. If you’re a regular FG reader, you may remember a while back that I wrote a piece reminding everyone the brilliance of 'Gold Against The Soul', an album that was rendered pretty awful and instantly forgotten by many. And in this comes the second benefit of the compilation - the inclusion of only the brilliant stuff. From the insanely powerful 'From Despair To Where' to 'La Tristesse Durera (Scream To A Sigh)', throwing in the perfect vehicle for James Dean Bradfield’s rasping Welsh vocals in 'Roses In The Hospital', its the perfect introduction for the casual Manics fan, if such a thing exists. While it pains me to admit that I don’t enjoy 'The Holy Bible', there is something magical about the music. Hearing 'Faster' blaring through a set of tinny headphones is a genuine treat, and one that garnered very puzzled looks from Newcastle’s commuters as I struggled valiantly to avoid bursting into said song at 9am. The same goes for the similarly epic 'Australia' and 'Kevin Carter', which fell during the band’s most commercial (and my most hated) album, 'Everything Must Go'. Featuring the repeated lauded and somewhat overrated singles 'A Design For Life' and 'Everything Must Go', the marking of the beginning of the more mature side of the band. Disc two of this mammoth collection begins with the most depressing moment in the Manics career to date, the repetitive systematic guitars of 'If You Tolerate This Your Children Will Be Next', affectionately mocked by my family changing the lyrics to "If you tolerate this then your children will shop at Next". Followed swiftly by the ironically titled, completely forgettable track 'The Everlasting' (yet another of those tracks that I’d never realised was a single) and that much-loved classic 'You Stole The Sun From My Heart', yet another fine example of the Welsh lilt. We reach some interesting lyrics with 'Tsunami', especially the line "Disco dancing with the rapists", definitely one that you wouldn’t come across in most popular music. 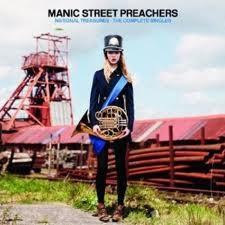 Couple this with the ferocious 'Masses Against The Classes', none other than the first number one of the new Millennium, and you have a clear indication that no matter what dirge the Manics can produce, they can also bloody pull it out of the bag. Two and a half hours is a terrific running time for an album, but 'National Treasures' is full of genuine delights. Yes there are the obvious singles above that everyone remembers, but its not all about the history. Take recent single '(It’s Not War) Just The End Of Love', the surest sign that the Manics are still as relevant as ever, with its fantastic guitars and one of the catchiest choruses of recent years. Ending the compilation on an unmistakeably Manics cover of 'This Is The Day' seems somewhat poignant, given the band state that their recent output is one last shot at mass communication. It’s also a fantastic way to end something that is so very special. There is something for even the most fair-weather Manics fan on here, and to anyone that gets to catch the band perform every single track, in order, on December 17th at the 02 Arena, I’ll be forever jealous to not be sharing a room with a band that mean everything to those very special people. 'National Treasures' is available to pre-order at Amazon.co.uk.